ACE Group is a prominent real estate brand in Delhi-NCR, with six successfully delivered residential and commercial projects and two ongoing residential projects under its name.ACE group has transpired to be an ace in the real estate arena, by delivering back-to-back successful projects in Noida and Greater Noida region.ACE is acclaimed for delivering exquisite constructions before time and a label which does not compromise on quality. Ace Parkway-is a brand-new luxury project by ACE group, located in Noida- Sector 150. 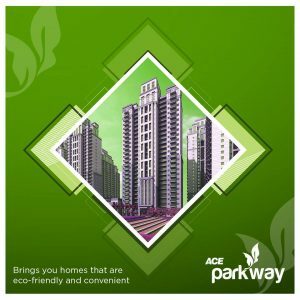 Ace Parkway is a perfect amalgam of luxury living, amazing location, and lush-green surroundings. It offers two, three and four BHK homes with state-of-the-art facilities. With its swift construction, Ace Parkway has set a strong benchmark among the high-rise properties in Sector-150, Noida. The pivotal location of Ace Parkway on the Noida Expressway makes it strategically one of the best real estate projects in Sector 150, Noida. Ace Parkway is artistically designed by acclaimed designers and architects, which makes it a delight to the eyes. Ace Parkway is located close to ACE’s another successful ready to move in luxury project– Ace Golfshire. It is located near to upcoming as well as currently operational malls, hospitals, restaurants, hotels, shopping complex, schools, and community centres which ensure convenient and luxurious living. It is in close proximity to major corporate giants and world-class sports facilities. Shaheed Bhagat Singh Park, located adjacent to Ace Parkway, adds to the panoramic view of the magnificent location of the luxury project. With the speedy progress of Noida-Greater Noida metro link that is likely to be operational by year-end, the proposed Sector-149 metro station is at a stone’s throw away distance from the luxury home. So those looking for a good investing options and those who are willing to relocate to the greenest sector of Noida can chose Ace Parkway hassle freely.